Until a few decades ago, the Random method of thatching, was common on many islands. Part of a clever annual crofting cycle; that provided both a new thatch and valuable manure; for some poor soil every summer. 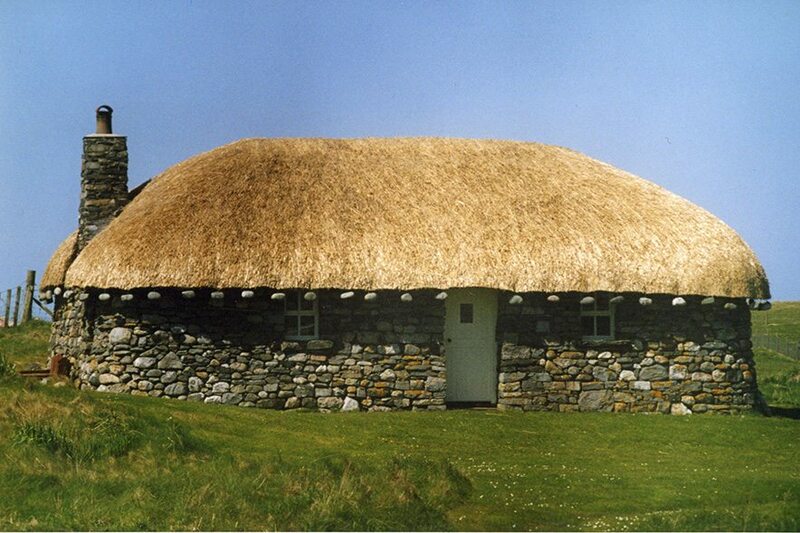 This was used mainly on a type of building, only found in the Hebrides; the Blackhouse. 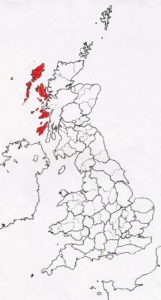 Or Taigh Dubh, in Gaelic; still the first language on many islands. Blackhouses… On the Isle of Lewis. 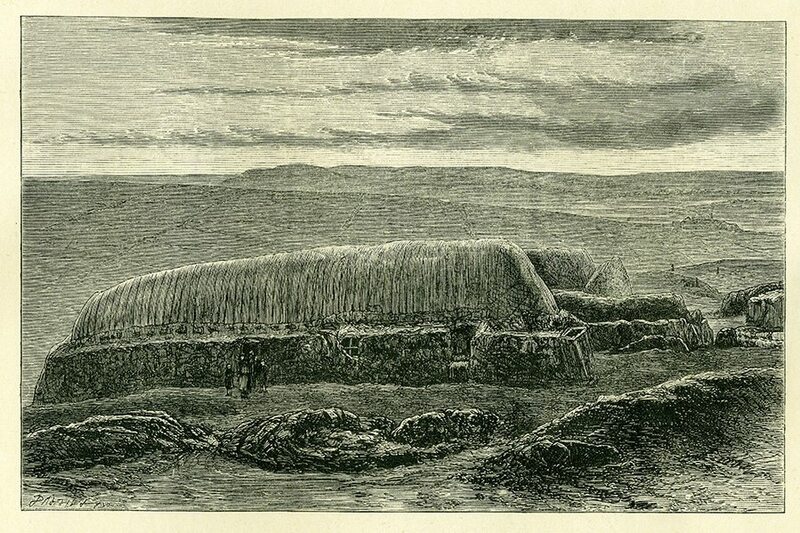 This engraving dates from around 1880. When hundreds of such buildings existed. Throughout the Outer Hebrides. These homes originally had no chimney or windows; probably giving them their name. The houses were built to take the worst Atlantic storms. With low stone walls, four to six feet thick (1.2 to 1.9m). And a wind resistant, low, hipped thatched roof. Driftwood or even whalebone, forming the roof ‘timbers’. As ever, wood was in extremely short supply. The roofs were normally stripped, often of both turf base and thatch, every June. The wet, soot laden old roof, made excellent manure. Being spread over the new crops, as frost protection. The next few weeks saw the roof rethatched. A little time could be taken, as the house was now unoccupied. 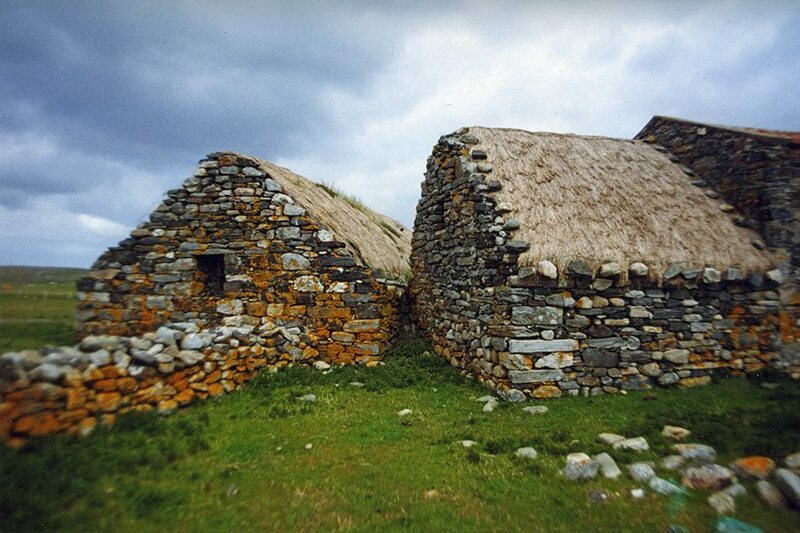 Both family and animals, who also shared the blackhouse; were away in the summer pastures. The family staying in small shielings; of turf and stone, for several weeks of each year. 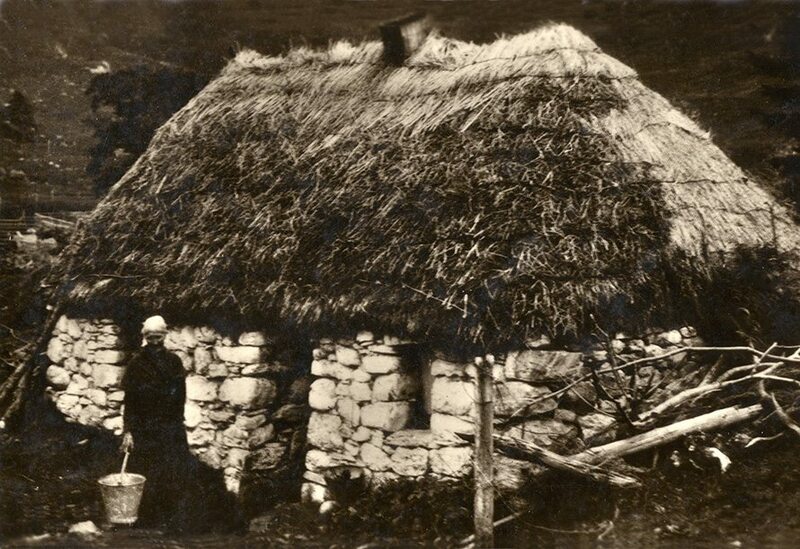 Thus this method of thatching, was perfectly suited to the crofter’s lifestyle. Rarely, on these islands, does the thatcher or tughadair, let the coatwork extend over the wall. 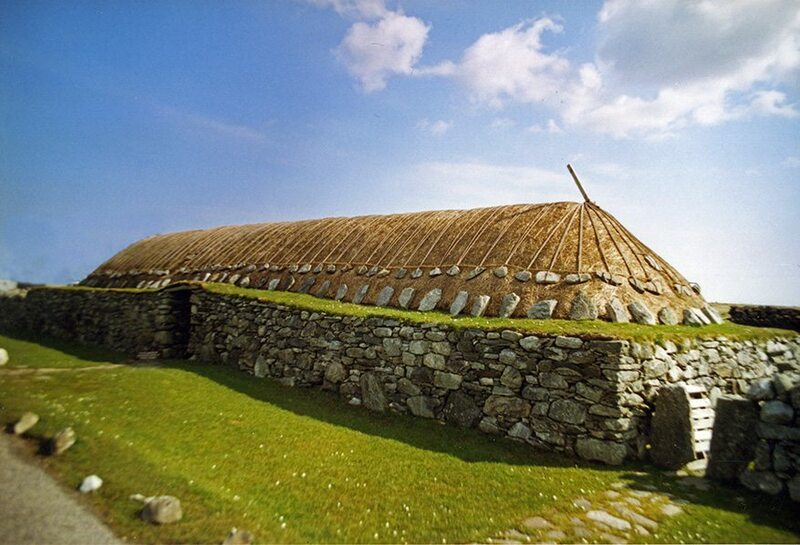 On the blackhouse they go a stage further, setting the roof some way back, on the turf covered wall head or tobhta. The turf draws the rain away, to the outside of the building. This important material, usually of heather, was often the by-product of peat cutting; every summer, for fuel. In the 1920’s, sixpence (2½p), would buy a hundred such sgragh. 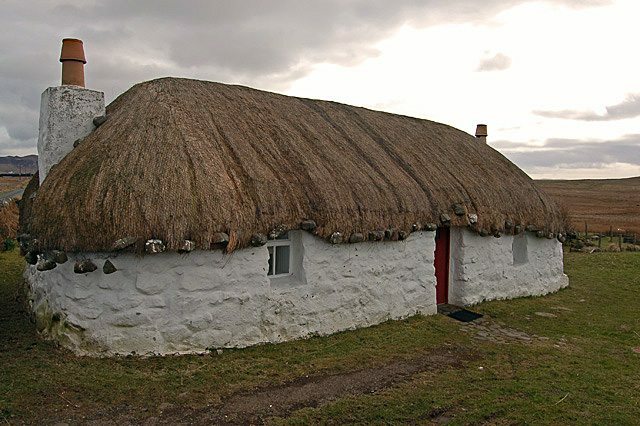 The thatching, tughadh; called random, is in fact done in a fairly directional fashion. 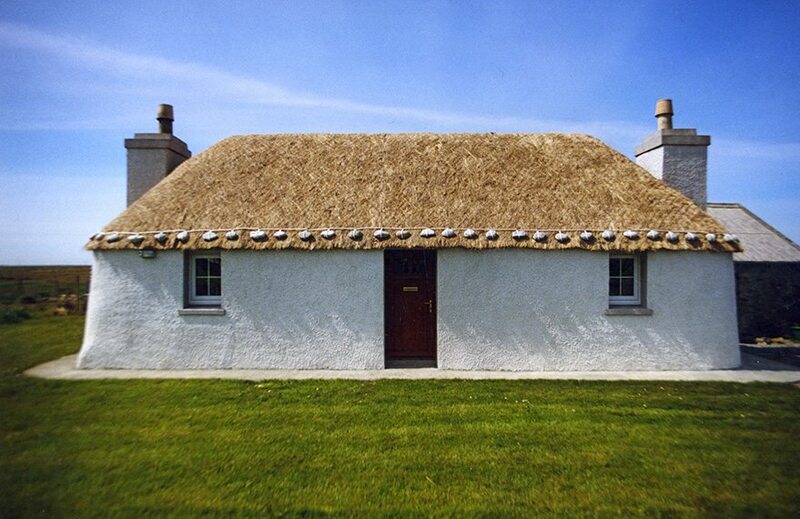 But consists of simply piling the thatch on the roof, often with a pitchfork. Relying mainly, on some tight roping and a short life expectancy; for a dry home. Barley straw, complete with roots, was the preferred material on Lewis. Oats, wild iris, marram grass, rushes or potato hulms, were all used in other areas. The material wasn’t that important; as it only had to last a year. James Boswell notes, on his tour with Dr Johnson, in 1773; that apart from straw; heather, fern and marram grass were all used on Skye. Held down by straw or heather ropes. Small timbers, called Crow Sticks or Maide Feannaig are fixed at the top of each hip. This gives the thatcher an anchor for the roping; which is so essential here. 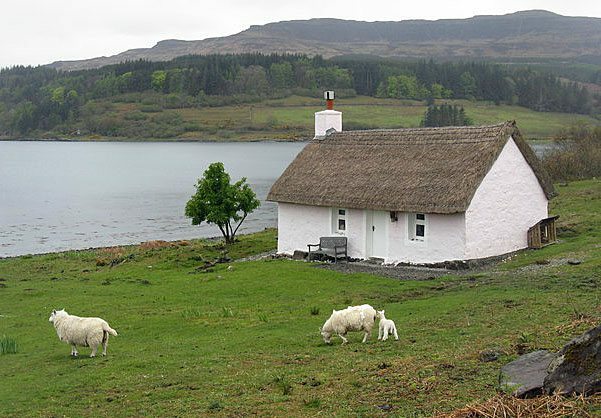 An old Gaelic proverb compares pointless labour to, ‘thatching a house without roping it’. 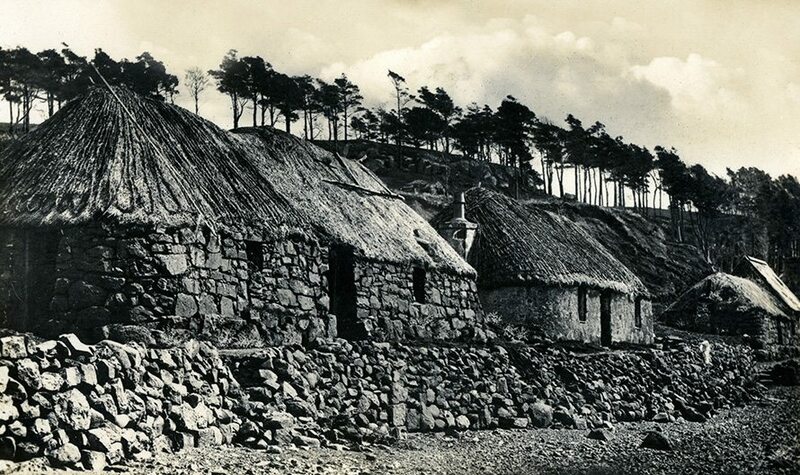 These ropes or suganain were often of heather, most communities having their own roof design. The smaller straight and diagonal ropes, or fiaragan, are held by a main rope or mathair shioman. This lies around thirty inches (75cm) up the roof. From this the all important stone weights are fixed. Roped… In around 1925. With both straight and diagonal weighted lengths. The crow sticks acting as a top fixing , for those covering the hipped ends. Although this cottage seems to have lost it’s right hand one. 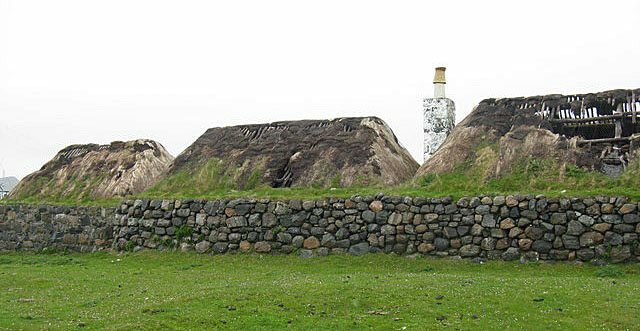 The smoky interiors of these blackhouses, were not always appreciated. By all accounts Prince Charles Edward Stuart wasn’t so bonnie, after spending his first night in Scotland. 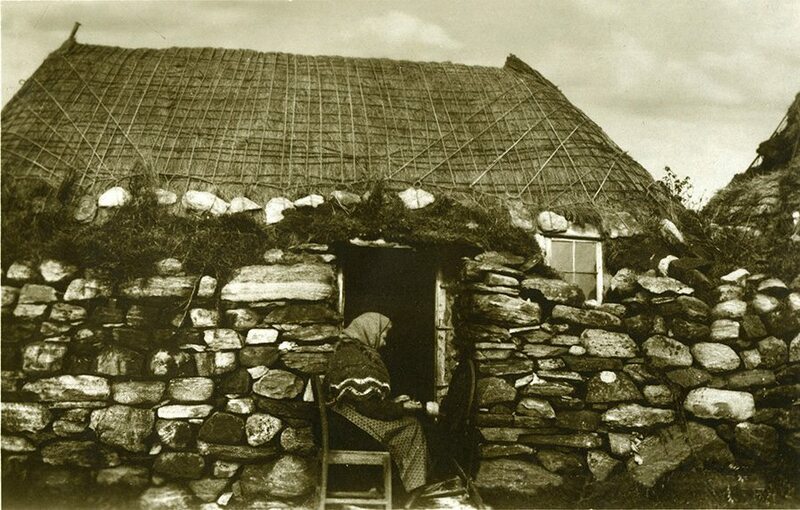 Sheltering in a blackhouse, on Eriskay in 1745, he needed some outside air more than once. 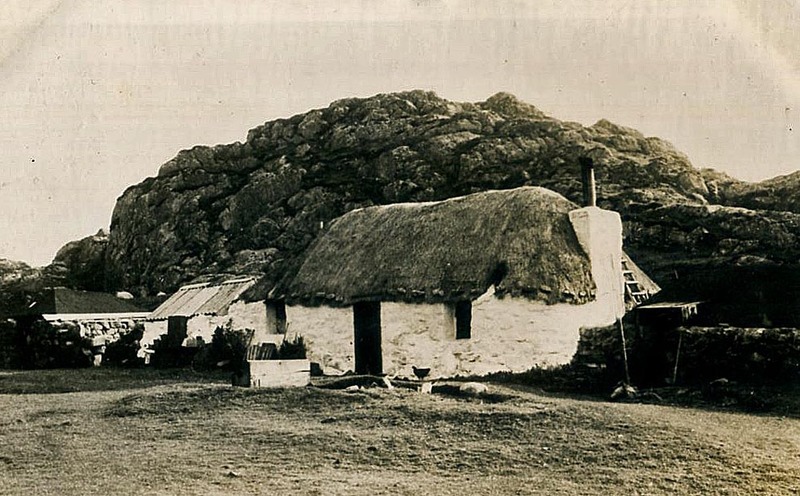 Early in the next century, Hirta, the main island of St Kilda; had a visit from Sir Thomas Ackland; the builder of Selworthy, the ‘picturesque’ thatched Somerset village. Unimpressed with what he saw, he left twenty guineas; to be given to the first family to improve their home. The St Kildans took the hint and soon had chimneys, a window or two and a dividing wall; between themselves and their livestock. 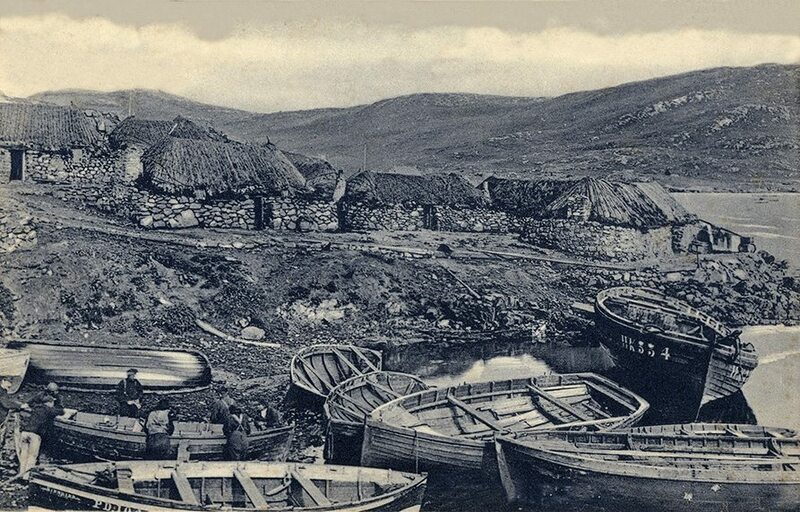 By 1975, this way of life was history; and so was the Blackhouse. In the 1960’s Historic Scotland, bought an unimproved example at Arnol, on Lewis. The next decade saw the nearby village of Gearrannan abandoned, for modern housing. Luckily these old buildings were also saved, the only large group now left. Both sites welcome visitors. As do most restored buildings, on the other islands. 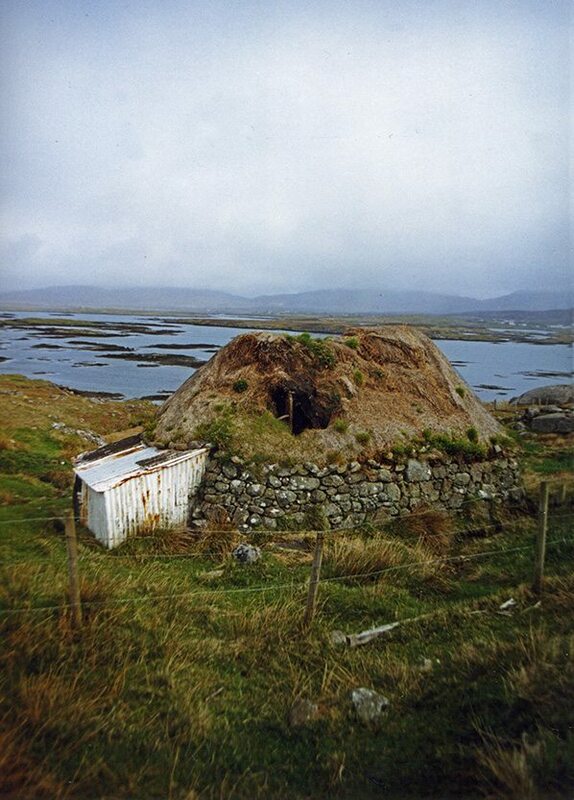 Arnol Blackhouse… A snug home until 1964. In earlier decades, the children from such homes, were easily noticed at school. As they always carried the sweet smell of a smoky peat fire with them. This survivor is no ancient building. Being constructed in the 1870’s. 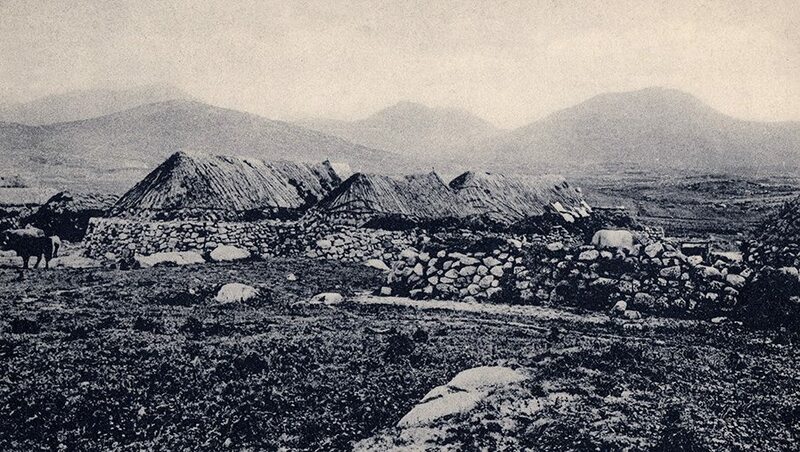 Long before the house at Arnol was built, another form of housing had appeared; the Whitehouse or Taigh Geal. As the name implies, chimneys and windows are standard. Some of these are converted blackhouses. These have a normal directional thatch, always on a turf base, extending to the outside wall edge. Usually lasting around three years or so; similar to work in other Highland areas. As elsewhere, wire netting replaced the attractive roping, in the mid twentieth century. An unusual sight… A new building, thatched. Finding a useful life, as a holiday home. On the island of Harris. Farm buildings on Berneray… With stone gabled ends. Not the usual, more wind resistant, hipped variety. 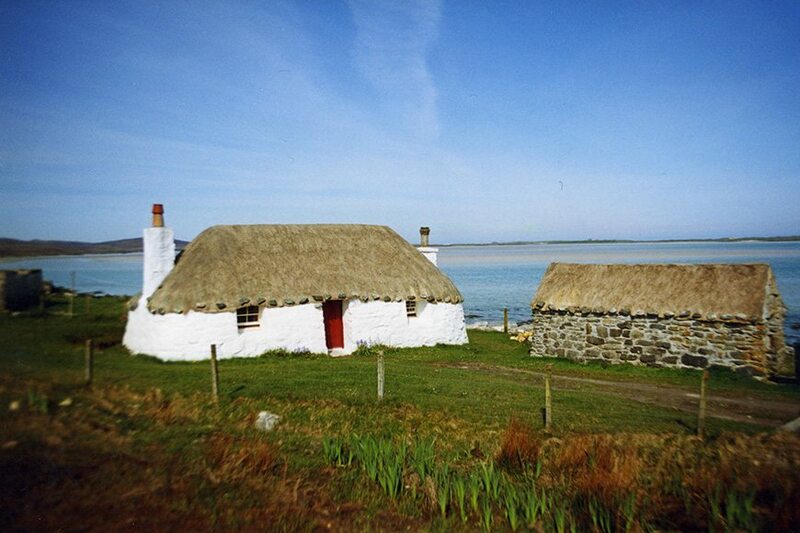 A dream cottage… On North Uist. With a thatch of marram grass, neatly wired and weighted. Black and white… On South Uist. 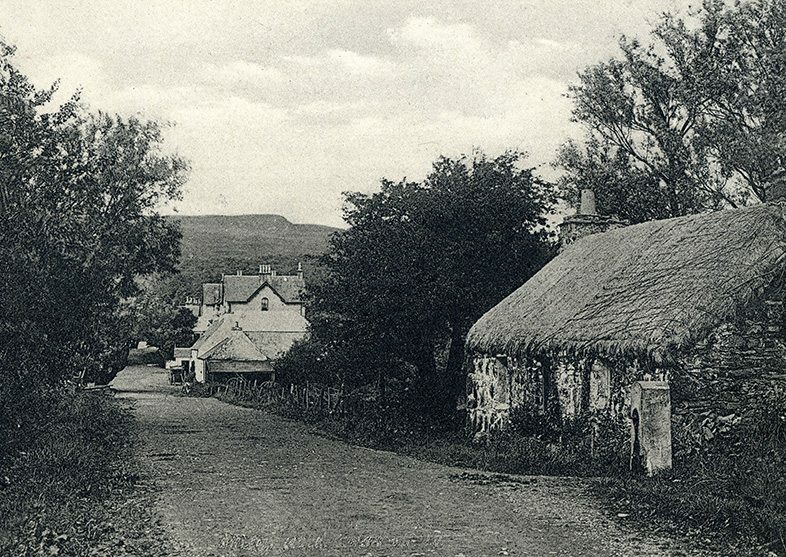 The left image , from the 1920’s shows a group of ubiquitous blackhouses, at Howmore. The right cottage, is a splendid example of a Whitehouse. And of some thatching, in marram grass. 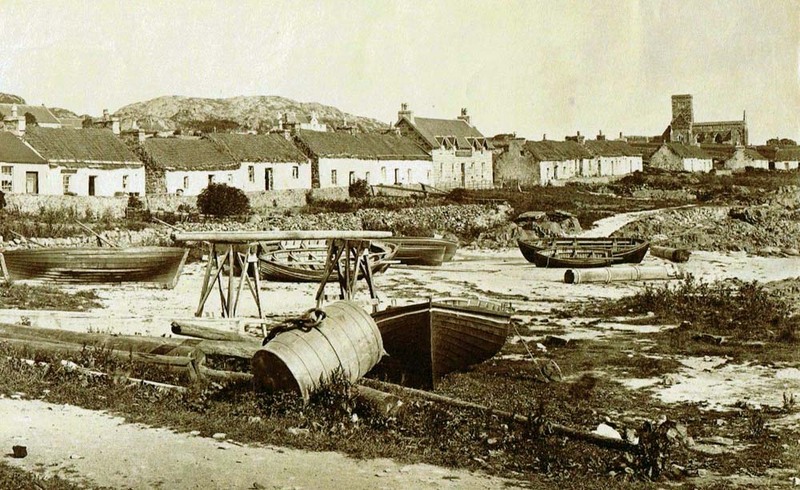 More blackhouses… On Barra, around 1910. 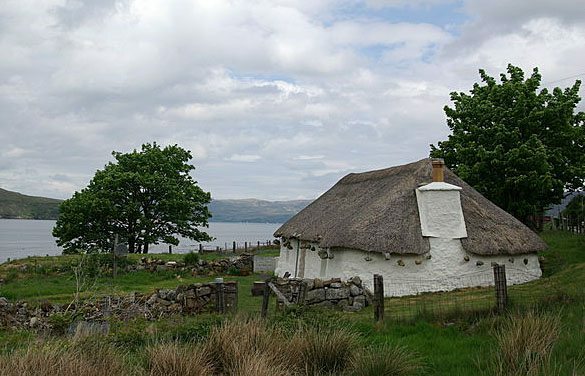 More Skye thatch… From yesteryear. 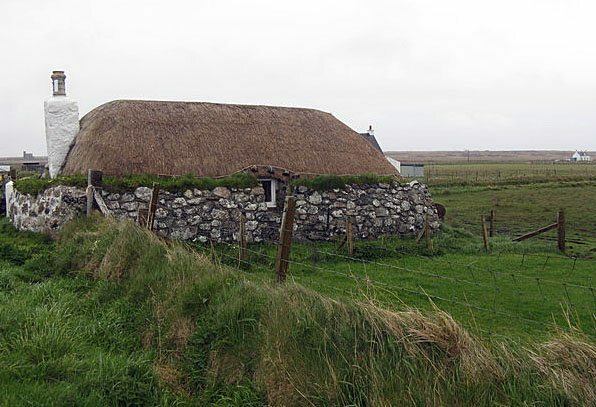 Unlike some of the Hebridean islands, there was a good deal of variation, in the thatching methods, used here. Apart from roping, some wooden outside fixings were also used. The right thatch being held on with crooks, and some rather thin, cabers. ‘The Street, Iona’… An image by the prolific Aberdeen photographer, George Washington Wilson; invited by Queen Victoria, to photograph the new royal estate at Balmoral, in 1854. 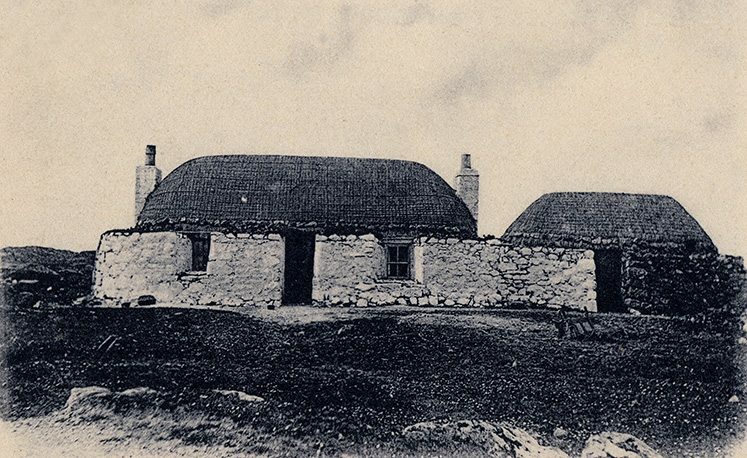 This later scene, from around 1880 shows roped and weighted thatch, on single story cottages, a scene that has disappeared, on this famous island. The end… Hopefully not for the craft, on these islands.